Pyramid Yogshala 200-hour Holistic yoga teacher training course focuses on Traditional styles of yoga, with comprehensive and genuine teachings on Yoga philosophy, yogic life, asanas, pranayama, anatomy, meditation, mantra-chanting, teaching methodology, alignement, and ashtanga vinyasa. You will learn from yogis who have been long studying and practicing Yoga and all its pillars. Pyramid Yogashala Teachers Training courses are comprised of small groups of up to 12 people, in order to provide intimate classes where the teachers can give proper personalized attention to each student. Small groups also generally connect and interact better and create a cool friendly atmosphere that tends to generate special bonds between the students and with the staff. Pyramid Yogshala 200Hrs YTTC is certified by Yoga Alliance USA, and grants a certified YA Diploma upon completion. During the course, you will be staying at the Pyramid Yogshala Guest house in Laxmanjuhla, Rishikesh, India. The school is situated in the heart of turistic Rishikesh, Next to the famous hanging bridge and holy ganga (Holy river), yet away from all the hustle and bustle of the main street. The place is a little bit high up the mountain, peaceful and surrounded by beautiful green gardens, and forest. We also have our own “almost” private waterfall. There are 2 yoga shalas, restaurant area with , and a beautiful green garden with a terrace. Cafés restaurants, shops, ATM, healthcare, organic stores. are in the neighbourhood, making Pyramid Yogshala the perfect place to host retreats and TTC courses in Rishikesh. Pyramid Yogshala has single and double room accommodation for the students and guests, all with own private bathroom. Some of the rooms have balcony with garden and Ganga view, where you can chill during break time. Rooms at the Pyramid are well maintained and clean. and bed sheets, pillows, bath towels, toilet paper, blanket and welcome amenities upon arrival are included. Wi-Fi is available at the restaurant area as well as free filtered water, and laundry service is provided on request. This course is tailored to meet the needs of beginners and intermediate yogis who want to pass on their passion on Yoga to others, or simply enhance their practice to a whole new level and deepen their knowledge on the subject. You will be immersed and living the yogic lifestyle for 28 days and experience the real indian yogic culture in first hand. This course is also a big opportunity for personal growth for you’ll be developing self discipline, selfcontrol, stamina, endurance and resilience, and learn spiritual and physical purification techniques, along with learning a new set of skills that will help you if you choose the Yoga Teacher profession. A big atencion is given to Yoga Teaching Techniques and Principles, as well as for correct alignment of asanas, and you’ll learn not only how prepare and conduct a class from beginning to end, but also how to demonstrate, adjust and help your future students to reach their maximum potential and get the most benefit from the asanas performed. Your level of fitness will improve significantly, and you will feel your body and mind much more strong, flexible, and balanced, and overall wellness because of the intense daily practices. Shatkarma is the Sanskrit term for one of the six yogic purification techniques (kriyas) as outlined in the "Hatha Yoga Pradipika." The purpose of these cleansing techniques is to keep the body strong, clean and healthy. They remove toxins and anything blocking the flow of prana in the body. Indian traditional yoga style is called "Hatha" (“ha” means sun “Tha” means moon) Unifying the sun and the moon within (Yin and Yang). It's a physical method for preparing and maintaining the body, providing stamina flexibility Balance and strength. This is the most tradicional popular and beneficial yoga style. The history of yoga, the sutras of Patanjali and the importance of yoga and its origins in India, are the subjects of these classes and lectures. Questions will be adressed and you will deepen your knowledge about yoga. This schedule can be changed and will vary from week to week. Final weekly schedule will be provided in the beginning of the course. He got his first experience of Samadhi at the age of 7. He had clear visions of a past life in the Himalayas. He completed his higher education from Agra University, obtaining a Master’s degree in Philosophy in 1977 as well as a Master’s degree in Yoga from Gurukul Kangri University in Haridwar in 1994. He currently teaches Meditation and Indian Philosophy in India and abroad. He also received initiation in Shankaracharya tradition through his master, Maharishi Mahesh Yogi. In 2007, he established the Prakash Yoga Seva Trust. He is old-handed in Meditation and other spiritual practices. Since 10 years or more; he is giving relaxing and refreshing talks on about Bhagavat Gita, Yoga, Great Yogic such as Jesus Christ, Lao Tzu, Jalaluddin Rumi, Boddhidharma, Buddha, Patanjali and Sri Krishna. The gentle and inspiring talks of Swami Ji helps in understanding the true meaning of yoga and its balancing impact on multiple problems. He clearly explains the Patanjali Yoga Sutras which makes a person strong, secure and self-sufficient. Swami Ji is really a kind and compassionate person with a soft & gentle voice. Born and brought up with an aim to acquire a yogi’s profession, Yogi Prashant’s family have seen a dream for him to reach the revering heights in yoga. With a desire to fulfil his family’s dream, he stated the training in yoga at a young age and felt the flow within in a high intensity. He completed his studies at Bihar School of Yoga and learned to live the life in a disciplined, devoted and a structured manner. The same attitude is reflected in all his classes, which start with mantra chanting, take a tour to Hatha yoga asanas and end with meditations. Ravi Nagar is the founder of the Pyramid Yogshala and the co-owner of the Pyramid café with his family. He has a BA in Yoga from the Haridwar University and is currently working on his Masters in Yoga. He cares deeply about offering excellent, safe and personalized yoga education to all students, which is why he created the Yogshala. Ravi is a real Yogi and not just because of his yoga practice, but because of the way he lives his life, putting his personal best in everything he does, and the graciousness he shows to the people around him. Krishna Panwar is a local to Rishikesh, educated in yoga with a BA in yoga therapy. She pulls from her love of nature and her devoted spirituality in her teaching of Hatha and Mantra chanting. She is not only an incredible yoga teacher but a powerful energy worker. She has a magical ability to help heal her students' pain. She takes her work very seriously and holds space for yoga that is strong, true and focused. Krishna pulls from the earth's energy and her God to create a true yoga experience. This is because though she is educated and grounded with knowledge. Yoga has been Manoj’s calling since early childhood. He was introduced to yoga by his grandfather who encouraged him to follow the path of karma yoga. Later on in his life Manoj explored Bhakti and Karma in depth to take his yoga journey further. Being born in Rishikesh he has always been absorbed in spirituality and yoga, which is why chose to share his experience through teaching. Manoj developed his practice learning and living amongst communities of Swamis and Yogis. His understanding of traditional yoga grew at Swargashram, Sivananda Ashram and Jai Ram Ashram. Omer Harsh BPT, M.SC is an osteopath, physiotherapist, an expert in yogic sciences. He has been educated in the United Kingdom, India, and Canada, and he combines the ancient science of yoga with modern medical sciences of the west. He teaches anatomy and alignment at the Yogshala. He uses his incredible understanding of the human body to help each person practice safely and get the most out of each asana. His knowledge of the human skeleton and physiotherapy combined with his knowledge of yoga allows him to give each person the corrections they need to heal injuries and pains in their bodies. This retreat will take place at Pyramid Yogshala in Laxmanjhula Rishikesh, India. Rishikesh is a holy city and is known around as the Yoga capital of the world. Every early March Rishikesh hosts the international Yoga Festival, organized by the world famous Ashram Parmarth Niketan. Rishikesh is, therefore, the perfect place to learn and study yoga. Surrounded by beautiful green mountains, the holy and mighty Ganges, Himalayan foothills, and tranquillity, the spiritual atmosphere of this place can easily be felt. monkeys, Squirrels, dogs and cows are everyday companions in Rishikesh just as parrots, peacocks and other species of exotic birds. The city of sages will lovingly receive you as it does for thousands of spiritual seekers, and so will our dedicated and committed staff. Daily freshly made vegetarian meals are included in the package of the course. The food is fully prepared hygienically and the vegetable is organic and locally produced. The food here at the Pyramids is well known all around the world for its taste and quality. What we eat, influences our physical well being, and also our emotions and thoughts. Yoga and Ayurveda classify food according to the effect provoked in the body and mind, and it can be of three types - Satva, Rajas and Tamas. Tamasic food is the kind of food which makes us lethargic or sluggish. Rajasic food is that which brings about activity or restlessness. Whereas, Sattvic food is the kind which makes you feel light, energetic and enthusiastic. Sattvic foods are those which purify the body and calm the mind. They stimulate the body and mind into action. Cooked food that is consumed within 3-4 hours can be considered sattvic. All food prepared at the Pyramids is Sattvic and prepared with love and in due proportions by our master cook and assistants. There is a lot to do and see around here. these are not included in the price but we can arrange upon request. Fly to Dehradun Airport (DED) and Pyramid Yogashala will provide airport pick-up to the school free of charge. 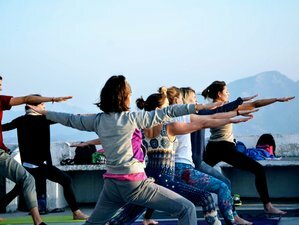 Pyramid Yogshala is a Certified YA Yoga school from Rishikesh India, providing Holistic Multi-style Courses, Retreats and Daily Classes in the Holly City. Students can arrive one day earlier. The first-night prior to the starting of the course is on us, no extra charge!.